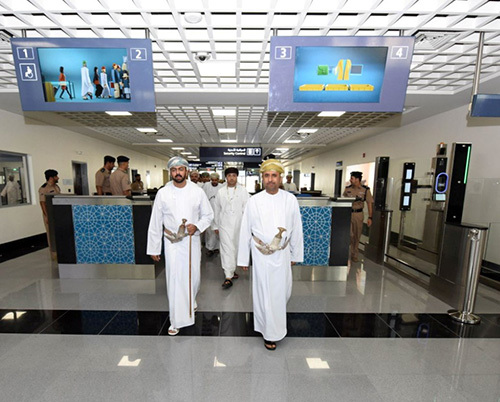 A’Duqm Airport passenger terminal in the Governorate of Al Wusta in Sultanate of Oman started operations Tuesday after completing all construction packages at a cost of RO90 million (US$ 234 million). This is the third airport in the Sultanate which enters the service with all its operational facilities after Muscat International Airport and Salalah Airport, according to Oman News Agency (ONA). The first flight to land in A’Duqm Airport passenger terminal was Oman Air WY935, coming from Muscat. The flight was received by Dr. Mohammed bin Nasser al- Za’abi, CEO of the Public Authority of Civil Aviation (PACA), Sheikh Meadhad bin Mohammed al- Yaqoubi, Governor of Al Wusta and a number of executive heads of the airlines operating companies, government authorities and a number of Royal Oman Police officers. Dr. Mohammed bin Nasser al- Za'abi and the attendees toured all the service facilities of the passenger’s terminal and were briefed on the services provided to passengers, in addition to visiting the control tower and were briefed on the latest technologies in the tower. He said the achievements of the civil aviation sector in the glorious era of His Majesty Sultan Qaboos Bin Said have been continuous since the first phase of Muscat International Airport was launched in 2014, the early operation of Sohar and A’Duqm airports and the operation of Salalah Airport in 2015 and its opening in 2016, followed by the full operation of Muscat International Airport. As for A’Duqm Airport, the operation is only a translation of the completion of the facilities at the airport as the airport was implemented in three stages. The first package included the construction of a road network leading to and inside the airport. The second phase included the establishment of the runway with international specifications, planes taxying and aprons. The third package included all the remaining facilities, such as passenger building, control tower, air cargo, meteorological and air navigation center. He said that most of the air transport agreements signed between the Sultanate and the countries of the world, such as bilateral agreements or open skies, included all the airports of the Sultanate and as the airport operated in 2014, so it is included the agreements. Dr. Al- Za’abi pointed out that the total cost of the airport amounted to about RO90 million, including the last package which amounted to about RO38 million (US$ 98.8 million). It is the first regional airport to be completed in all respects and is designed according to the specifications of the recognized airports. For his part, Sheikh Ayman bin Ahmed al- Hosani, CEO of Oman Airports, said that the services will be provided by the company at A’Duqm Airport, which will be through 5 counters to complete the travel procedures with two gates connected to the jetway and 4 disconnected, in addition to the internet service, businessmen hall that will be run by the company, adding that the duty free shops will open in the next period, in addition to cafes and shops to serve passengers. He said in a statement to reporters that the company is currently working in its marketing plan to attract international airlines to run its flights through the Sultanate's airports, including A’Duqm Airport, through participation in international conferences and exhibitions of aviation and tourism. The CEO of Oman Airports said that the Omanization rate at A’Duqm Airport has reached 100% and that the airport accommodates 500,000 passengers annually and can be expanded whenever needed.